Hersh Fine Art, of the Long Island Academy of Fine Art, is pleased to present a group exhibition of drawings and paintings by Cornelia Hernes, Stephen Bauman, and Steve Forster. Glen Cove, NY - August 27, 2015 - Hersh Fine Art, of the Long Island Academy of Fine Art, is pleased to present a group exhibition of drawings and paintings by Cornelia Hernes, Stephen Bauman, and Steve Forster. The exhibition will be on view from September 19 to November 30, 2015. The artists will be present for an opening reception on Saturday, September 19, from 6pm to 8pm. This exhibition reunites three graduates of the Florence Academy of Art in Florence, Italy. Studying together over 10 years ago at this prestigious institution, each artist brings his and her own unique vision and experience in this show. Hernes and Bauman currently reside in Sweden as principle instructors at the Gothenburg branch of the Florence Academy of Art. Forster, a resident of Glen Cove, is director of the Long Island Academy of Fine Art, where he also teaches. Cornelia Hernes’ still-life paintings are a clear and transformative view of the objects she holds and touches. In an age of speed and efficiency, Hernes invites the viewer to pause and observe the things with which she interacts and to consider the beauty to be found there. Rarely is such a love and care for objects so finely reproduced in oil paint, but more distinctly, it is unusual to see still life paintings that capture life and time within their quiet, self-contained spaces. Rather than stopping time and preserving her subjects in a single stiff moment, the viewer sees the slow passing of the minutes; the roses seem to shift as gravity slowly pulls them down, and their petals seem to loosen. 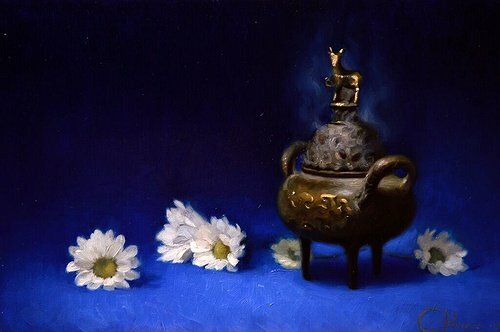 The incense fades and reappears with the subtle currents of the air. Stephen Bauman melds form and atmosphere to illuminate the connection between the physical and spiritual. His respect for life and the human form are easily seen in his figurative work, and his drawings are an homage to the craft itself, offering an observable dialog between the artist’s mind and hand. Bauman’s watercolors show a spontaneity and immediacy that is distinct from his drawings and oil paintings, whereas the oil paintings show the controlled and articulate execution of sophisticated emotion. In his series of landscape paintings, Steve Forster brings together a poetic vision of Long Island that draws from a Romantic tenor and sense of story. Deliberately and imaginatively composed, the paintings may be more accurately described as narratives than landscape renderings. The trees take on human-like gesture and form; posed in an interplay with each other, the light, and surrounding elements, they suggest an underlying story that may not immediately be perceived. As a director carefully places actors on a stage for visual impact and nonverbal storytelling, Forster uses depth and atmosphere to establish relationships and mood within his narrative landscapes. This exhibition will run from September 19 through November 30, 2015, with a gallery reception on September 19 from 6-8pm. For details please refer to www.hershfineart.com or contact Rebecca Forster at 516-590-4324 or on email. Memorial Day Weekend 2015: Celebrate with Fireworks, Parades, BBQs & Lots of Family Fun! Fall Festivals, Endless Entertainment, News & More in September 20th's Newsletter! Subject: LongIsland.com - Your Name sent you Article details of "Cornelia Hernes, Stephen Bauman, and Steve Forster: Selected Works A Group Exhibition at Hersh Fine Art, September 19-November 30, 2015"